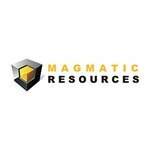 Since listing in May, Magmatic Resources (ASX:MAG) has been crossing off drilling tasks at a rate of knots. The newly listed copper-gold explorer has four exploration projects, including eight tenements (one under application) covering more than 1049km 2 in the historic East Lachlan Fold Belt in NSW. The East Lachlan Fold Belt is prospective for high grade gold, copper and base metals mineralisation. 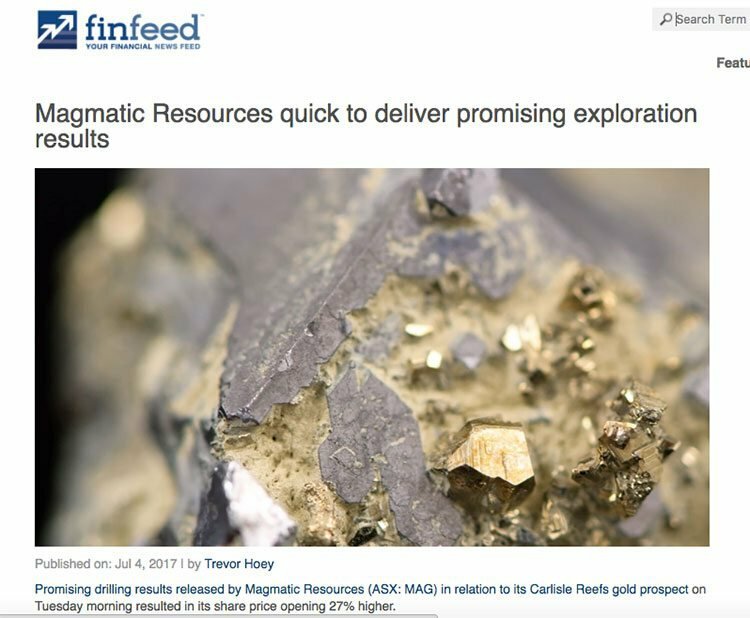 MAG purchased its four advanced projects from the $41 billion Gold Fields Limited, the world’s seventh largest gold producer, which remains a major 20% shareholder illustrating how valuable these assets may be. Gold Fields has spent $13.5 million exploring projects in the region, known for producing excellent greenfield exploration projects. This includes the $15.7 billion capped Newcrest Mining’s Cadia Valley and Evolution Mining’s Cowal project. Newcrest Mining’s Cadia Valley is the third largest gold-copper porphyry in the world, producing 2 million ounces of gold and 75,000 tonnes of copper per annum. Evolution Mining’s Cowal project is a 5 million ounce project, producing up to 300,000 ounces of gold per annum with a life of mine exceeding 20 years. MAG is chasing copper porphyry targets in the medium term, whilst exploring near-surface gold deposits that may lend themselves to open pit mining and toll treatment at nearby mills. Its flagship project at the East Lachlan Fold Belt is Carlisle Reefs. In July, company impressed the market with encouraging drilling results in relation to its Carlisle Reefs gold prospect. However, the latest findings could further indicate what happens to MAG’s share price in the coming weeks and months with a steady stream of assays to come. It should be noted here though that MAG is a speculative stock and investors should seek professional financial advice if considering this stock for their portfolio. 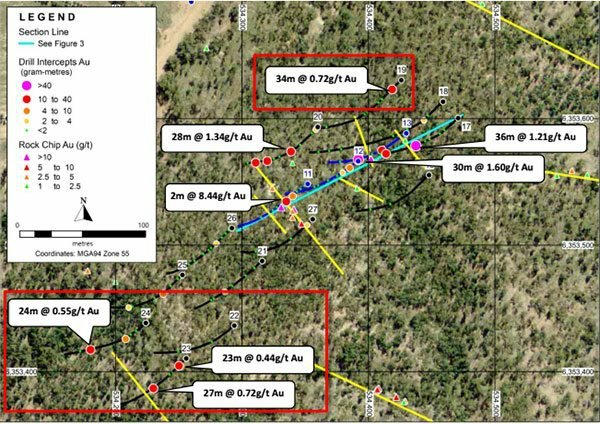 The combination of new and updated results out in October have extended the gold mineralisation at the Central Vein Zone to 150 metres vertical from surface, and it remains open at depth. The 1 metre re-split results have defined a higher-grade interval of 2m at 8.44g/t Au that is 40m vertically beneath the projected position of an historic shaft. The new gold zones have been intersected and remain open at depth and along strike. 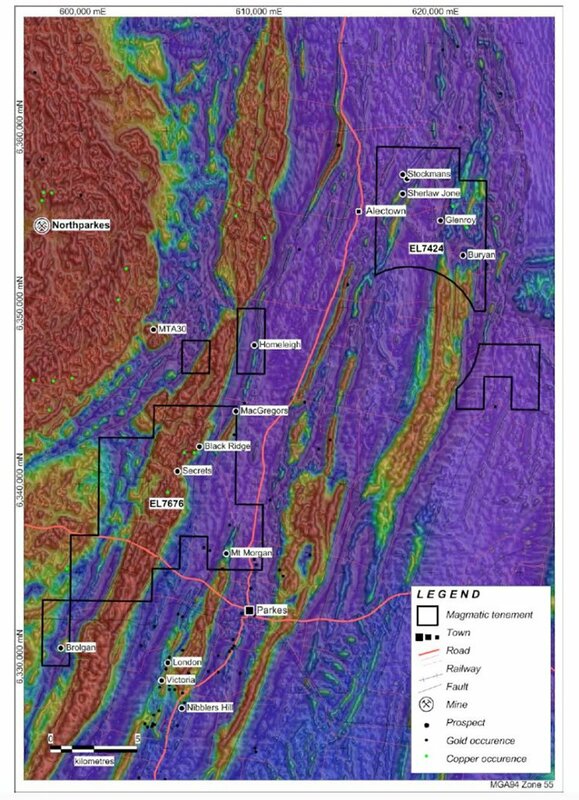 Other big news since our last update includes the commencement of drilling at MAG’s Parkes and Wellington North projects, an initial drill program at its Brolgan prospect with Parkes backed by a $3 million JV with Japan, Oil, Gas and Metals National Corporation (JOGMEC), and first AC drill program of its Lady Isle porphyry prospect now completed and awaiting assays. MAG has location on its side, promising results under its belt for Carlisle Reefs, three drilling campaigns completed and awaiting results... and, all in all, plenty of fodder for share price-moving news flow. If the company is looking to establish itself in the historically lucrative region of East Lachlan Fold Belt in NSW — and shore up the potential of its projects — it seems to be going about it the right way. Here’s a look at the proximity of MAG’s advanced projects to Cadia Valley, Northparkes and Cowal. The Carlisle Reefs Project is MAG’s maiden exploration target — so what better place to kick off than the latest news to come from that project. Since we last wrote about MAG the company has released two rounds of news from Carlisle Reefs. Carlisle Reefs goldfield is located at the southern end of a regionally extensive magnetic trend that extends from the south. The drilling programs so far tested beneath historic workings where rock chips have previously indicated the presence of high grade gold. And successfully targeted areas and gold-bearing horizons with internal “high-grade shoots”. By any measure, the results represented an excellent first pass at confirming the significance of previously reported high-grade gold rock chips at surface at Carlisle Reefs... with the results highlighting the potential for extensive mineralisation at depth, as well. Highlights included 8m at 5.00g/t Au from 74m; incl 2m at 18.05g/t Au; 30m at 1.79g/t Au from 80m; incl 16m at 2.09g/t Au; and 6m at 3.59g/t Au from 46m. But the company needed more drilling to clarify the geometry of the mineralised zones— which brings us to its latest announcement regarding the second round of RC drilling of Carlisle Reefs at the Moorefield project. All up, the latest results extend the gold mineralisation at the Central Vein Zone to 150 metre vertical from surface and open at depth. Of particular importance are the new gold zones identified via hole MFRC019 (shown boxed in red in Figure 1) where significant shallow mineralisation were intersected, and in holes MFRC023 & 024 approximately 200 metres southwest of the previously drilled area. The same announcement stipulated results for the 1 metre re-splits from the first round samples. The 1 metre re-split results have defined a higher-grade interval of 2m at 8.44g/t Au that is 40 metres vertically beneath the projected position of an historic shaft. The new gold zones— which remain open at depth and along strike— are located within an +80ppm arsenic soil anomaly. In late October MAG introduced us to a gold prospect at its Wellington North Project, Lady Isle, while simultaneously informing the market that drilling had commenced at the site. This Lady was in waiting up until recently, when it seems the time was right for MAG to kick off exploration via an aircore drilling campaign. The Lady Ilse prospect is located 12km north of Wellington in the northern part of the Molong Volcanic Belt of the Macquarie Arc. 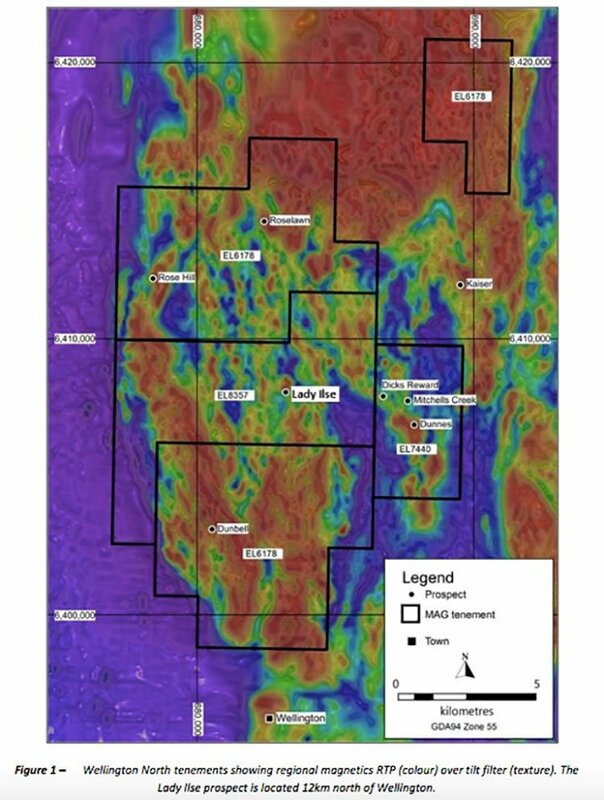 This first round of drilling is a follow up to soil sampling and AC drilling undertaken at the prospect during the 1990s, which identified gold anomalism over a 400 metre diameter area coincident with a magnetic anomaly. Nearby drilling had intersected sub-volcanic porphyry... and a nice big porphyry deposit is exactly what MAG has its hopes pegged on for Wellington North. However it is early stages here and investors should consider all publicly available information and take a cautious approach to any investment decision in this stock. The recently completed program was for a total of 30 AC holes for 750 metres to test the prospect. The drilling tested for both open anomaly vein-hosted gold mineralisation and porphyry-style copper-gold mineralisation. The proximity here is relevant precisely because historical production from the orogenic vein-hosted gold deposits at Dicks Reward and Mitchells Creek was 230koz of gold at a gold grade of 26g/t Au. Previous drilling at Rose Hill also ‘hit gold’, intersecting porphyry-style copper-gold mineralisation including the impressive result of 71m at 0.3g/t Au, 0.43% Cu & 57ppm Mo from surface. The company seems to prefer making progress in multiple directions at once — and as a strategy for a budding small-cap, this seems like a smart way to go. MAG’s joint venture with JOGMEC will see the latter fund $3 million into the company’s copper-gold porphyry Parkes Project — including an initial first year $1 million exploration program. The company has completed drilling at the Brolgan copper-gold prospect at the JV project — which means we can expect drilling results soon to come hot off the press. Brolgan is 24km south of the Northparkes porphyry copper-gold mine (with a whopping endowment of 4Moz gold and 3.7Mt copper) within the southern section of the Northparkes Volcanic Group of the Macquarie Arc... which has shown, via previous aircore drilling, defined low-level zinc, copper, sulphur or possibly gold anomalism which remains open to the south-east. This is the first round of drilling for Brolgan so the fact it has all kicked off now is a pretty big deal for both partners. Two 350 metre holes were planned, with the purpose of the program to gather information regarding the controls on mineralisation and therefore identify targets for the $3 million exploration budget planned over the three-year period. 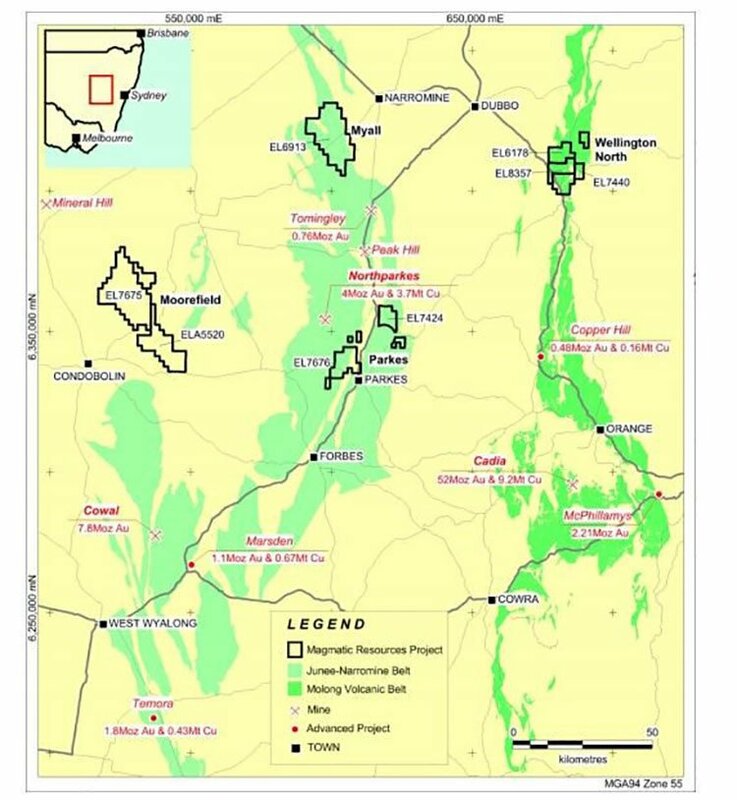 To refresh your memory, the Parkes JV stipulates that JOGMEC can earn up to a 51% interest in two exploration tenements — EL7427 and EL7676, in East Lachlan NSW — by funding $3 million in exploration expenditure over three years... that said, MAG will remain as Operator of the project on behalf of both parties until the point if/when JOGMEC becomes majority owner. JOGMEC is the Japanese governments resources agency and one of the world’s leading greenfield exploration entities with an enviable history of success where it comes to copper/gold porphyry deposits. Its level of experience, combined with MAG’s technical team, gives the JV an excellent head-start at Parkes. 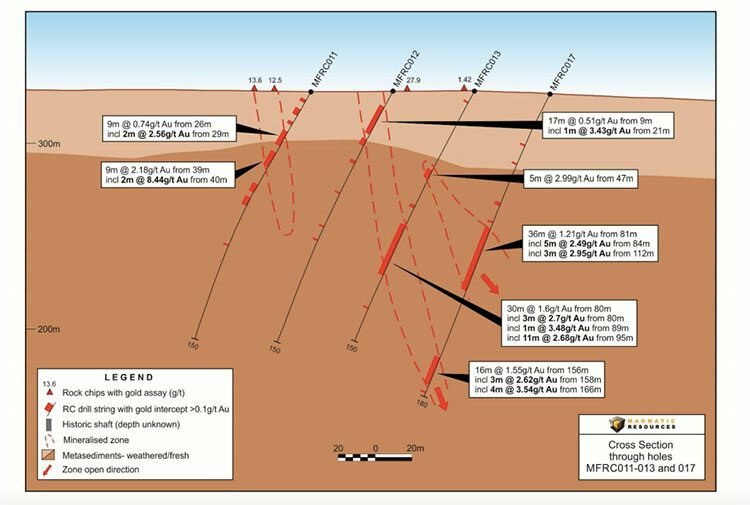 Some of the noteworthy past findings at Parkes include shallow percussion drilling (<60m) returned 16m at 1.22g/t Au, 4m at 1.9g/t Au and 19m at 0.63g/t Au while follow up drilling (2 holes for 418m) returned significant shallow gold including 30m at 0.49gt Au and 26m at 0.55g/t Au at MacGregors prospect. And, at Stockmans prospect, two shallow percussion holes to test Au As soil anomalies intersected 14m at 1.01g/t Au from 47m and 12m at 1.42g/t Au from 7m, incl. 6m at 2.44g/t Au, terminating in mineralisation. Meaning... the company don’t know how much further it goes. Holding $3.08 million at the end of the June quarter, MAG currently finds itself in a prime position with several promising-looking projects starting to come together. Occurring in the background is auger soil sampling at the Pattons and Boxdale prospects within the Moorefield Project, as well as aircore and RC drilling at the copper-gold porphyry target at Rose Hill prospect within the Wellington North Project. Multi-tasker MAG is keeping several irons hot in the fire, and its options open. It wouldn’t be surprising if MAG was preparing a surplus of potentially market-moving announcements very soon.